Groundwater Protection | Texland Petroleum, L.P.
As recently as last summer, U.S. Department of the Interior reported to Congress that “we have not seen any impacts to groundwater as a result of hydraulic fracturing.” In May 2011, EPA administrator Lisa Jackson told the U.S. Senate that she wasn’t aware “of any proven case where the fracing process itself affected water.” Letters from dozens of state environmental agencies – offices that have been regulating the fracturing process for decades — also confirm the safety of the technology. Primarily because state regulatory programs place a great emphasis on protecting groundwater. 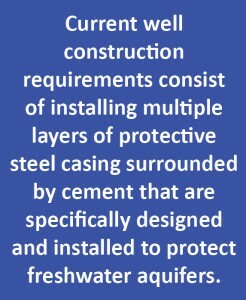 Current well construction requirements consist of installing multiple layers of protective steel casing surrounded by cement that are specifically designed and installed to protect freshwater aquifers. These measures are completely effective in protecting drinking water aquifers from contamination. “Drilling fluids tagged with unique markers were injected more than 8,000 feet below the surface, but were not detected in a monitoring zone 3,000 feet higher. 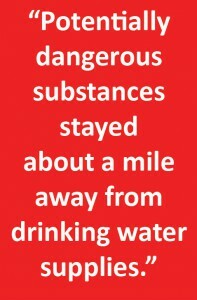 That means the potentially dangerous substances stayed about a mile away from drinking water supplies. Texland recently conducted a micro-seismic study of a hydraulic fracturing job in Andrews County. During a frac job on a horizontal well, seismic equipment was lowered in a nearby vertical well to “listen” for cracking rock. The study showed that fractures stayed within 50 feet of the intended zone which is approximately one mile below the surface. Impermeable rock barriers above the formation prevent the transmission of fluid closer to the surface.